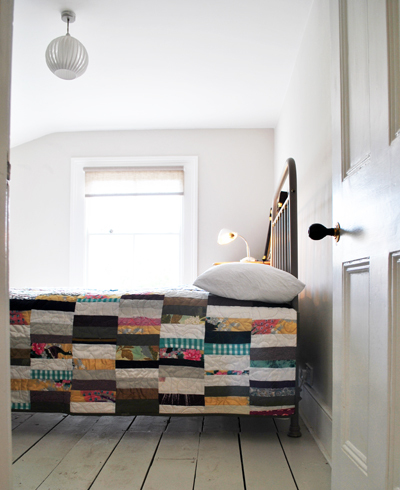 Roaming the pinboards for inspiration, I stopped short when I saw this piece of patchwork, from haven. 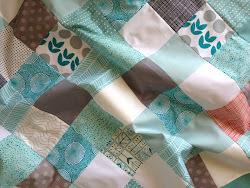 I've been wanting to use some of the old quilt scraps that Justin's grandma gave me to make a new quilt -- to take some of that beautiful hand-stitching and not just recycle it, but take it back to its old life a little bit. And maybe transfer some of that seventy-year-old magic to my slightly more modern choice of fabrics. Red, white and grey -- the official sponsors of Christmas 2011. Can you spot the antique? Happily, my giant pile of "nice fabric" old clothing is shrinking down to a single box. The lid doesn't quite fit on it yet, but we're getting there. Also in the mix: a pair of baggy Thai trousers from our honeymoon that never quite looked as hip once we were back in America, mikodesign's lovely russian doll fabric, a great stash of red fabrics from my Mum, a rather more revealing top than I'd ever like to admit to wearing, and a couple of those $1.99 a yard! fabrics I see now and then at Walmart and can't resist, though I don't know what to do with them. 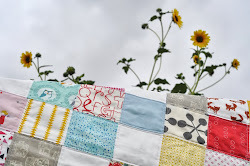 Love the way you are using these fabrics- I recognise a few of them! That looks east enough for me to have a go at quilting.